Batting: Shane Dowrich 71 off 132 balls, Jason Holder 74 off 123 balls. Bowling: Lakmal 2/52 in 19 overs, Rajitha 3/68 in 17 overs, Kumara 4/58 in 23.3 overs, MDK Perera 1/16 in 10 overs. Batting: MD Gunathilaka 29 off 73 balls, Kusal 22 off 59 balls. 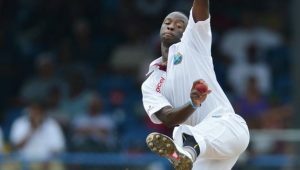 Bowling: Kemar Roach 2/13 in 8 overs, Shannon Gabriel 2/42 in 10 overs, Jason Holder 1/11 in 9 overs. Play resumed on Day 2 as Holder and Dowrich walked out to bat and Sri Lanka’s pacer, Rajitha started it off for Sri Lanka. Both batsmen added another 25 runs and brought the first hundred run partnership of this innings. In order to get a breakthrough a change in bowling was made as Lakmal brought on Kumara. Holder got to his fifty as the stand between these two batsmen was looking threatening. 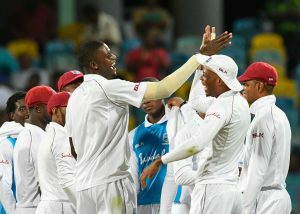 But in the very same over, Kumara pinned Dowrich lbw to deny him another century and West Indies lost their 6th wicket. David Bishoo joined Jason Holder. But, his job to hold the other end lasted only for a few overs as Kumara’s pace outdid Bishoo’s tactics and West Indies lost their 7th wicket. Roach joined Holder and Lakmal brought Rajitha into the attack. 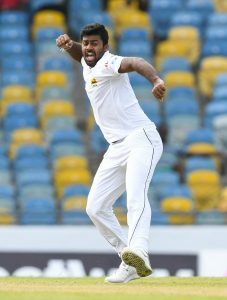 This change up in bowling worked once again as Rajitha claimed the wicket of Holder; courtesy of Dilruwan’s magnificent catch. Cummins joined Roach. Rajitha and Kumara continued to bowl at the right lengths and continuously beating the two batsmen for pace. But, the two batsmen stayed strong and didn’t lose their wickets. This is when Perera was introduced back into the attack and he struck straightaway to get rid of Cummins. 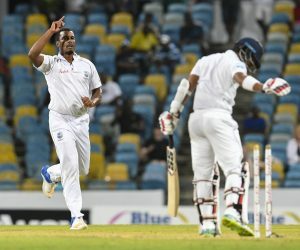 Gabriel joined Roach and he departed in the very next over to Kumara who claimed his 4th wicket and West Indies were all out on 204 runs. Kusal Perera and Udawatte walked out to bat, meanwhile Roach and Gabriel started it off for West Indies. Chances were created by these two bowlers from their very first overs and they paid off as Roach claimed the wicket of Perera who went back on a duck. Gunathilaka joined Udawatte. Both batsmen added 16 runs to the total before Roach struck again to claim the wicket of Udawatte. 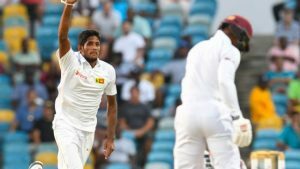 Kusal Mendis joined Gunathilaka. Mendis started playing cautiously while Gunathilaka seemed aggressive as he was getting a boundary every other over. Both batsmen continued their batting prowess and shared the first 50 run partnership of this innings. Dinner was called. Play resumed after dinner for the final session of the day and a replenished Gabriel struck straightway by taking the wicket of Kusal Mendis. 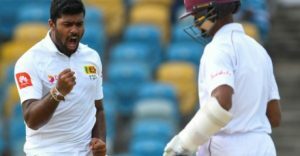 De Silva joined Gunathilaka who also couldn’t last long as he was pinned lbw by the West Indian captain, Jason Holder. Roshen Silva joined De Silva. But this stand lasted only 2 overs, as De Silva got out and Gabriel got his 2nd wicket of the innings. Dickwella joined Roshen Silva. At this point, Sri Lanka had now lost half of their wickets with only 85 runs on the board. Both batsmen added 14 runs to the total when rain stopped play and it continued raining as stumps were called on Day 2.